I squeezed in a little more spinning this week. I managed to get a 3.7 ounce braid of merino/silk spun up pretty quickly. 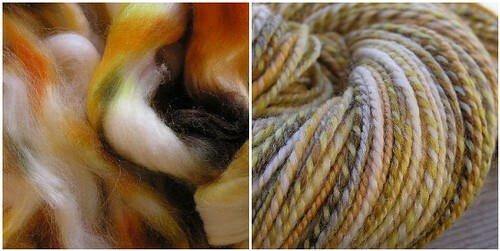 The roving is from Pigeonroof Studios in the Honeybee colorway. Its an 80% merino/20% silk that has a nice little sheen to it (but was really hard to draft). I ended up with about 238 yards of a heavy sportweight yarn. This should make a nice cowl; or mittens! In other crafty news, I am planning on diving into the world of sewing later this month. I’m hoping to start a class here when the next round of Basic Sewing starts up again. For my birthday, my quilter mom gathered together all the necessities. I seem to also have started a fabric stash along the way as well!